This week I saw some interesting survey results showing that over 30% of those who took this survey will budget for up to $1,000 on Christmas, but over 20% of these same people expect to overspend! If you have a budget in mind, why are you expecting to over spend? The survey was done by Fair Go Finance and had 3,940 people take it. Some of the other facts that stood out to me were the fact that 36.25% expect to spend more on Christmas than they did last year, 28.23% of people don't even keep track of their spending and 20% plan on going into debt or using a bonus to pay for Christmas. This is crazy! The people involved were pretty evenly split around Australia, between the ages of 18 and 60, mostly on incomes under $75,000 and only slightly more females than males. This survey shows to me that despite the fact we all know Christmas comes at the same time every year, many of us do not budget or plan for it appropriately. I'm a single mum and I know how hard it can be to give your kids everything you want to give them but the most important thing for kids is fun, memories, knowing they are loved and not a bunch of 'stuff'. Growing up we had traditions like the Christmas tree went up on the first Monday of December, on Christmas Eve all the kids slept in one room, we had an advent calendar my mum made that had pockets and in each pocket we placed a lolly for each family member plus something to do each day eg sing a Christmas carol, do something nice for someone else, bake cookies together etc. All these things made Christmas special. I plan for Christmas by putting aside money every pay, working out who I need to give presents to, what they might like, what gifts I could make and working out my budget which I stick to. Then I start getting what I need throughout the year, in sales and listening to those around me to see what they want as well. Instead of one person catering for everything, get everyone involved to bring their favourite dish and share the load. I am one of 9 kids, most are married and there are quite a few nieces and nephews now. You can imagine how crazy and expensive Christmas would be if we all bought for each other. Instead, we pull names out of the hat and buy for a few nieces/nephews each, don't buy for adults (except our parents/grandparents) and have reduced the amount of gifts while increasing the quality of gifts everyone gets. Check out local Christmas light displays, get involved in local Christmas events and find out what fun free things there are to do where you live to entertain the kids. Buy a long roll of butchers paper and let the kids go nuts decorating it. It's cheaper than Christmas paper and is a great annual tradition for the kids too. If you know where you need to go or what you will be doing over the Christmas period, do some research to find out the cheapest and most practical way to travel, then book ahead of time to get the best deals. 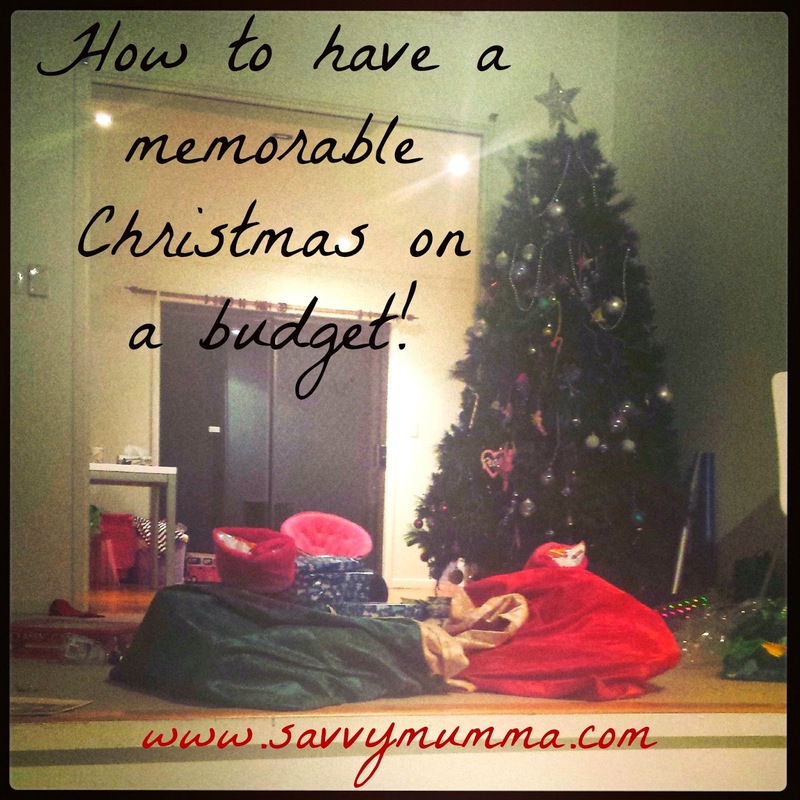 What do you do to save money at Christmas? How much do you budget for and do you mange to stick to your budget? We moved house again last month. Our last move was meant to be the final one until we bought our own home, but circumstances changed and we had to move again. Fortunately our new home will be our home as long as we want. I know the owners are not going to be selling, especially now we are here. My daughters adore it and best yet, we can do anything we want to it. I moved 2 nights before I flew out for an overseas conference, then it was school holidays so I am only just catching my breath now to sort out the house properly. I am pretty excited to say the least about implementing some tiny things that make a huge difference to organization within the home. We started with the garden this week. 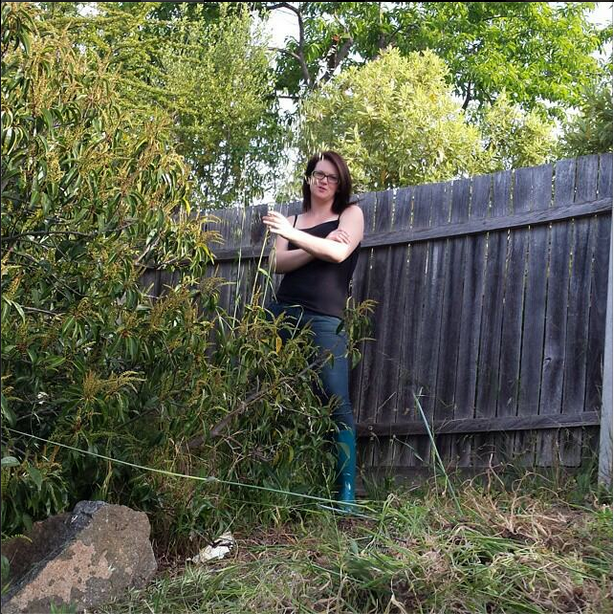 The weeds are taller than me in some sections. We will be planting a vegetable garden. There is already an established orange tree and I noticed our back neighbours have chickens, which is something we want too. It is such a relief to be living somewhere I know we can be for years and that I can treat as my own home. In my last property I couldn't even have fish according to my lease. The plan is to stay here for sometime while I invest my money elsewhere. I want to make this our home, but as frugally as possible. What ways have you renovated, improved a home or garden on a budget? This is a firm family favourite. Here's the way my mum always made it. Whip the cream, then add the icing sugar. In a dish place a layer of biscuits followed by a layer of cream. Repeat this until everything is used up. Leave in the fridge over night to set. Before serving crumble the flake or sprinkle the grated chocolate over that. Serve. To make it like a log I layered the biscuits and cream in an ice cream conatainer. The next day I scooped spoonfuls out onto a tray and shaped it into a log. I put cream over it and sprinkled it with chocolate. Some people soak the biscuits in liquer first, but I don't drink alcohol and I don't use it in my cooking, nor did my mum. I've also sliced banana over the top before serving because I didn't have enough cream for the top layer and it went slightly brownish, so I used the banana to cover it up and everyone loved it. So if you'd like it to be slightly different, banana's or strawberries taste good with it. In the past year we have barely been to the doctor. I like using natural remedies, especially for viruses, colds, coughs and similar. I have a collection of resources I use as needed and various ingredients I ensure are always on hand. 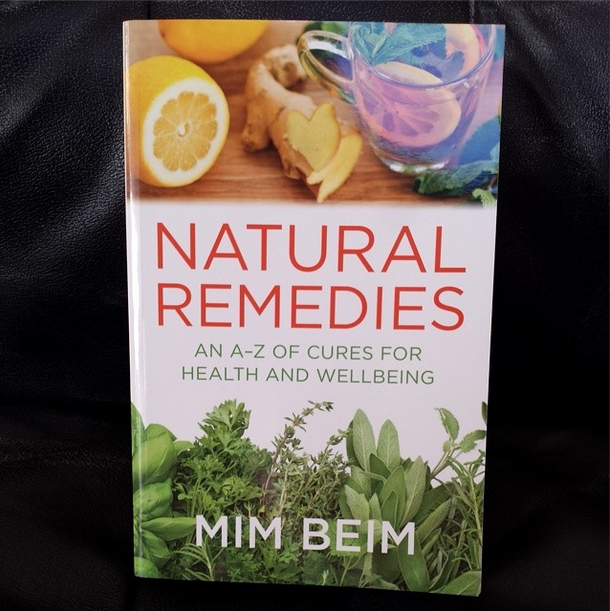 Last week I was fortunate to receive a copy of Natural Remedies by Mim Beim, one of Australia's most respected naturopaths. It covers over 200 ailments with natural remedies to help. Each ailment is clearly described, what causes it, dietary advice, remedies and other advice. It is very easy to read and being an A-Z reference it is the sort of book you can keep on hand as needed, flicking through when you feel something coming on to get the remedy instead of having to read the whole thing cover to cover. That said, it is great to read about the different remedies and how similar remedies can fix different ailments. 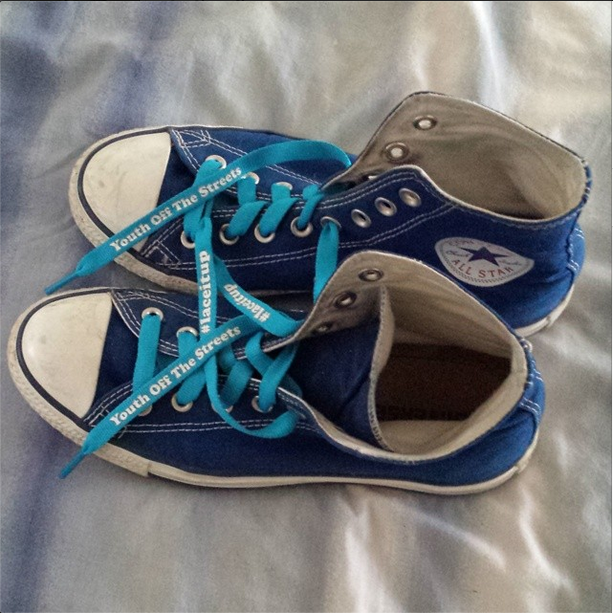 It is very easy to read, understand and follow the practical tips and remedies Mim offers. I don't often get sick and am fortunate that the few times I have it has not been too bad, however, I have discovered there are natural remedies that work much faster for me than many prescribed medications and without side effects I have suffered before. There was one particular issue that had I not used a natural remedy for it, I would have required surgery. Instead, it took 2 days to clear with no side effects, not time off for anything and I was able to do it at home, quickly and easily. What natural remedies have you tried or are your go to methods? Disclaimer: this is simply my opinion and even though I prefer natural remedies, you should seek your own professional advice for your ailments and issues, making your own decision about natural remedies. Check out www.rockpoolpublishing.com.au for this and more great books!